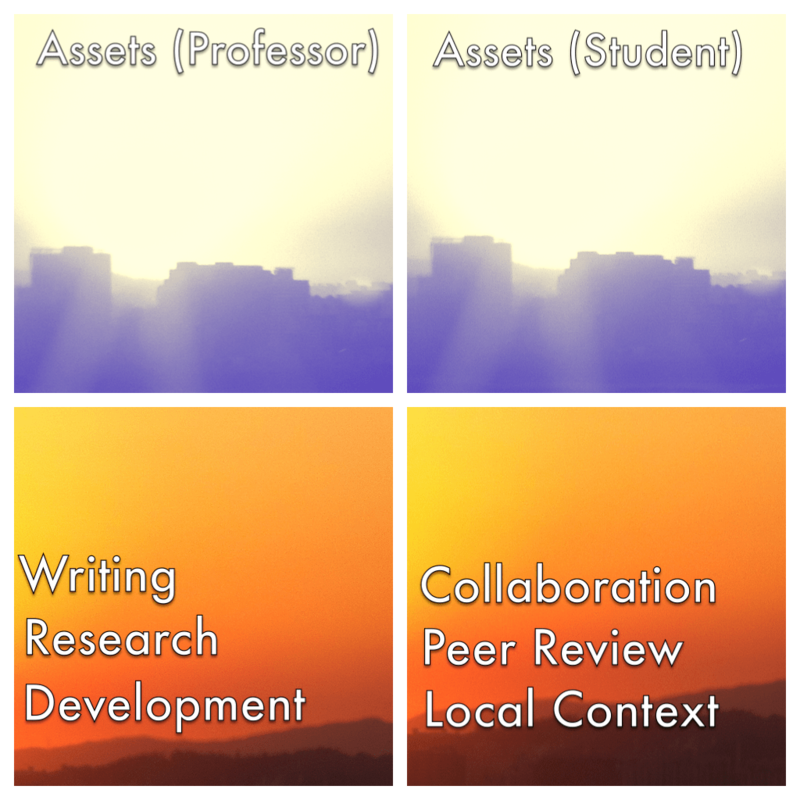 Today, some thoughts on the intersection of service, security, sharing, and collaborative learning. I am fully aware of how academia and teaching is a bit of a barter economy. I help you with a paper or project; you return that favor later on (or not, in some cases). I review this; you review that, etc. That barter economy is also, I suspect, one of the accelerating agents of overwork or overextension in the academy. One can never have too many connections, too many projects, too many papers in various stages of completion, too large a network, or so we implicitly project. I tend to consider myself a relatively high-output sort of person, but even I am shifting in that regard. Less papers and projects, but a greater attention to the ones I am working on. Deeper dives on less data and research; greater attention to teaching. That sort of thing. It is an evolution, a burgeoning professional maturity (or maybe I am just getting tired). However, I do believe there is room on a social level to reorder priorities to free up a bit more time. I am talking minuscule amounts of time. An hour here or there, maybe 5 hours a term. Time, however it is defined, is the real currency of the realm. We are overextended, so we have little of it. Consequently, time is at a premium. But with a level-headed review of current outputs and time expenditures, shaving off those that contribute little to our or the project’s betterment, I suspect we can clear up some space to reprioritize, or reinvest the time more efficiently. And I believe a good deal of that could go towards service. Service of the pro bono variety, a professional expectation whereby we are expected, perhaps even obligated to contribute above and beyond coursework. A service orientation, while still hinging on the scarcity of time, provides a clearer adherence to the value of our contributions: expertise, experience, and capacity for mentoring. We (instructors or researchers) give our time. The student who is mentored agrees to enter into a collaborative, peer relationship with another student (either within the university, or, more preferably, from outside the university). So we are trading time for time, essentially. Nothing new here, really. What I am trying to configure is a toolkit that would facilitate such an exchange. I am agnostic in this respect and am perfectly willing to cobble together whatever is needed, but ideally this system would scale out to a larger entity than just one professor doing this on their own. I imagine the following tools would be necessary, all of which I am trying to configure through a series of disparate WordPress plugins as we speak. Not succeeding yet, mind you, but trying. There is a better solution, but this is how it might work on an individual level. Scheduling Agent (for students who want mentoring or digital office hours to sign up and block off on our respective schedules (several WordPress plugins seemingly fit this bill). Chatting/discussion function (several that quality, but will most likely try to use some iteration of BuddyPress). Profile/member/role management. Something that allows for profiles to be made (or better yet, imported from elsewhere), connections to be made, roles to be awarded and assigned, etc. Again, BuddyPress seems to qualify. Collaborative space. The discussion function might qualify, but I was thinking something a bit more dynamic. Must have security and privacy controls. Export/import function. Both parties should be able to provide evidence of their work. Credentialing (optional). This is here just to possibly create some automated way to acknowledge that parties were meeting their professional or academic expectations. More than likely Open Badges. Professor/instructor/teacher posts their availability per term (I suspect 5 hours per term would be more than enough) on their calendar. Ideally this is all aggregated at a university level to demonstrate total hours of expertise available (like 40 hours for History, etc.). Student from different university (ideally, perhaps, a sister university or some dedicated channel of collaboration) signs up for mentoring time. Student A and Student B are matched based on research interests (or whatever metric provided). Student A and Student B are asked to collaborate towards the production of some project (essay, multimodal composition, dialogue) that is due at the end of term. Instructional presence and students submit evidence at end of term. But I never wanted it to be a mandatory, organizational-level requirement. I want it to be a group of pro bono, volunteer individuals dedicated to using tools, time, and expertise in the most beneficial way possible. So I look to open tools, learning, etc. for guides in that respect. Open Learning (including MOOCs): I think these courses have at least identified that there is a desire, if not a resiliency, towards self-betterment and collaboration. We can be as cynical as we want about the MOOC learning experience, but it has identified interest. We could develop a transparent mechanism for those who, upon completion of MOOCs, to enter into a more secure, more intimate (i.e., collaboration on a very small scale) peer learning scenario. I like P2PU (and FutureLearn as well, to some degree) in this respect. Open Badges: I see Open Badges as possibly an identification management tool, as well as an agent for generating possible credentialing. If I am forced to use third-party systems, I would prefer it to be Mozilla. Open source and peer to peer: this tool would be open source, available as code on GitHub or as a torrent. I would want it to be configurable to anyone who wanted it. That is the whole point. I see P2P (peer to peer) applications playing a role here as well aside from mere data transfer. I would want these learning connections to be P2P if at all possible. No funneling through third party applications if it can be avoided. Data is between them and them alone. It is basically only an application that would match individuals based on profiles, data, information found elsewhere, so I don’t think this is beyond the realm of possibility. Secure, encrypted communications: this all depends on the level of security and privacy that the parties involved would want, but I see this as a dynamic, authentic method for teaching everyone (professors included) about data security and privacy. Towards this end, although it is a bit more time-consuming, I would suggest using secure email systems, secure data management and sharing options (I am using SpiderOak more and more), secure communications of any sort (trying out ChatSecure now). This is an important aspect of the whole process, one that can provide an authentic literacy. We can (and must, I am increasingly thinking) provide learning opportunities that specifically address how our information is being used, how our activities are being tracked, and what that means for our interactions in this world. This isn’t any sort of paranoia talking; this is an opportunity to learn. One with many real-world applications. So I see a tool like this, born of service and rooted in security and transparency, as a boon for organizing time (as instructors). I see it as a boon for mentoring students and allowing them to learn from each other. I have already begun to reconfigure my priorities towards this type of approach, clearing out an odd hour here or there for this. It will take a lot more thought and effort to make this more than just a personal preference or peculiar eccentricity at odds with the academy (as I have been told already). I don’t mind that kind of feedback, though. It is instructive, aside from the legacy posing as criticism bit. We are in this to contribute, to make it better than how we found it.